The couple lost their rental accommodation last year and found it impossible to find somewhere to live. 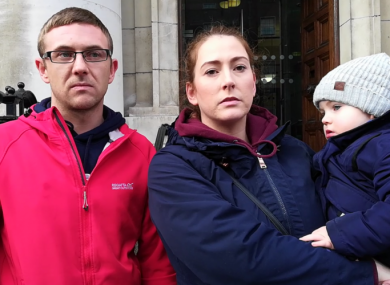 A FAMILY WHO have been homeless for seven months have said a weight has been lifted off them since they heard they have been allocated a local authority home. TheJournal.ie first met Kelly Priestly, Glen Kilty and their two-year-old son Alan in November last year when they were living in a homeless hub. They had lost their rental accommodation and found it impossible to find somewhere affordable to move into, even though both have jobs. “We don’t earn enough to buy, to be approved for a mortgage and the rents are gone up that high that we can’t rent either so where do we go? What do we do? We’re stuck. And then the stress of trying to get up to go to work everyday and trying to rear your child,” Priestly said at the time. Speaking to TheJournal.ie yesterday, she said they got a letter four weeks ago offering them a house in a new council development in Churchtown, south Dublin. “We were down in the council office the next morning to accept. I couldn’t believe our luck. I knew how we were feeling, but I didn’t realise how heavy it was weighing on me until the stress was gone. And with Alan [her son], his humour has changed. We knew it was affecting him, we saw the negative side of it so seeing the positive effect now is just amazing. He’s thrilled, earlier on he was bringing my sister up the stairs to show her his room. He’s so excited. There are currently 1,614 homeless families in Ireland, according to the lastest figures from the Department of Housing. This includes 3,624 children. Last year more than 14,000 new households came onto the council housing lists. Dun Laoghaire-Rathdown County Council has said it is committed to delivering 1,563 social housing units by 2021. The council is examining a number of sites it owns including the delivery of 155 social and affordable homes at Enniskerry Road, Stepaside, in partnership with the Housing Agency and Respond and Túath approved housing bodies. Lands at Shanganagh Castle have been earmarked to deliver approximately 550 homes when infrastructure is in place. The council is also asking vacant property owners who are willing to sell to the council to get in touch. Email “'I didn't realise how heavy it weighed on me': Homeless family on getting keys to their council house”. Feedback on “'I didn't realise how heavy it weighed on me': Homeless family on getting keys to their council house”.